Aga Khan Museum is pleased to partner once again with Rumi Canada to co-present a new chapter of Inner Journey, a series of performances inspired by the timeless teachings of Rumi, Hafiz, and other Sufi mystics. Led by ethnomusicologist and performer Amir Koushkani, this event features live music and whirling dervishes from Rumi Canada. Koushkani is joined onstage by Sirishkumar Manji on tabla, Sardar Mohammadjani on oud, Zohreh Shahbazy on daf and percussion, and Siavash Kaveh and Koroush Babai on kamancheh. On Thursday, May 10 at 8 pm, Amir Koushkani will host a lecture at the Ismaili Centre, Toronto. Admission to this lecture free for those attending Inner Journey IV. 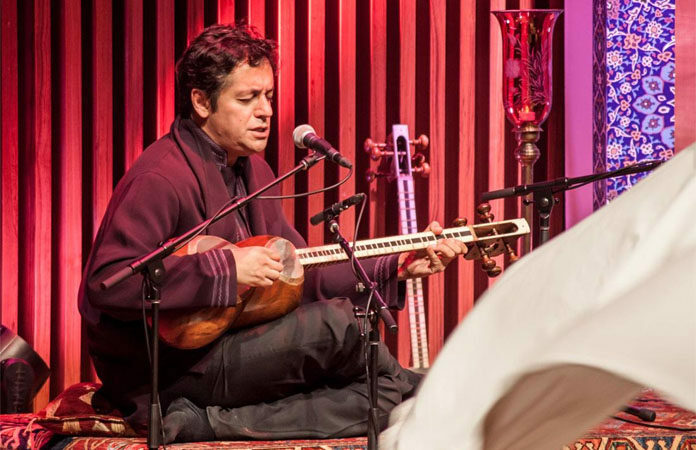 Amir Koushkani’s training in Persian music began in Iran, where he was introduced to traditional Persian themes under the tutelage of Master Dariush Pirniakan. He holds a Masters Degree in Western Musical Composition and received a PhD in Ethnomusicology at York University, where his dissertation covered the history and theory of Iranian musical transcription. He has recently published a two-volume study on the Persian Avaz in collaboration with master Mohammad-Reza Shajarian and Professor Rob Simms at York University. He most recently performed at the Aga Khan Museum and Ismaili Centre Toronto during Nuit Blanche programming in October of 2017. Sirishkumar Manji is an Indian classical tabla maestro who was introduced to the instrument at the age of seven by his late father and teacher Pandit Bhagwanji Manji, who in turn learnt from the great singer Pandit Omkarnath Thakur. Manji has been performing ever since, working with a range of musical talents and performers, combining Indian classical flavours with modern, classical, and various other traditions. He currently spends his time as a performer, producer, composer, and teacher. Sardar Mohmmadjani, born in 1978 in Mahabad, a city in Iran’s Kurdish region, chose the tar as his primary musical instrument at the age of 10. In 1997, he left his city of birth to study at the College of Fine Arts, University of Tehran, where he also took an interest in the oud. During his studies of ethnomusicology at the University of Paris, he collaborated with the Badila band and the Institute Jeunesse Musicales de France (JMF). He currently resides in Toronto and performs across Canada. Zohreh Shahbazy is a talented daf and kamancheh player who was a member of the Iranian youth orchestra ensemble of Vahdat Hall, and has performed in more than 350 concerts in Iran alone. Since arriving in Canada, she has collaborated with organizations including Rumi Canada, Janna, the Andalib Ensemble, and others. Siavash Kaveh also plays kamancheh and daf and graduated from the University of Art in Iran with a kamancheh performance specialization. In 2014, he moved to Canada, and has since performed with a range of artists locally and nationally. Kourosh Babaei was born in 1971 and began studying the violin at the age of 12 before switching to the kamancheh, and performing in several traditional music ensembles at a variety of festivals, events, and venues around the world. Farzad AttarJafari studied classical Sufism under the direction of several masters. He has trained as a Semazan (whirling dervish) and studied a range of Sufi dances, music, and poetry. Born in Tehran, he has performed across the US and Canada and currently lives in Toronto, where he serves the Sufi whirling dervishes community and hosts regular educational sessions.